Far Cry 4 is the upcoming first-person shooter from developer Ubisoft Montreal. 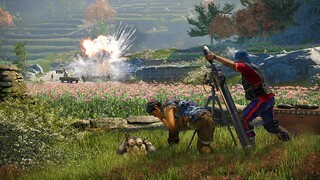 Set in the fictional Himalayan country of Kyrat, this nation torn apart by war draws heavily from real-world locations to make the game feel authentic. We caught up with Mark Thompson, narrative director, and Alex Hutchinson, creative director, to find out how visiting Nepal to meet people who actually fought in the civil war helped to inspire the development of Far Cry 4. “One of the first things we did was to write down a list of different animals to include in the game,” Mark told us when we met up with the team at Ubisoft recently in Montreal. By meeting local people who had been affected by such conflict, what the team learned in Nepal altered the direction of the game irrevocably. “We are not a grey-brown military shooter. You’re not in the game because you made a promise to someone or to get your men back from behind enemy lines — we tell ‘fish out of water’ tales. You will have caught a glimpse of some of the more extreme aspects of Kyrat in the recent trailers involving Far Cry 4’s big bad — Pagan Min. You’ll see him on the cover of the game wearing a bright pink suit and rocking a bleached blonde hairdo, but Pagan Min could have sported a very different look. “Initially Pagan Min was kind of a straight down the line, classic dictator,” says Alex. With much more info to come surrounding the seemingly psychotic Min, this is one tyrant sure to titillate and terrify in equal measure. 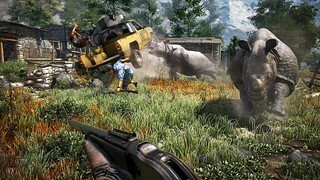 There are several aspects to Far Cry 4 that show it as a game with its tongue placed firmly in its cheek, whether you’re experiencing over-the-top action aboard a gyrocopter or charging enemies atop an elephant. One area we found particularly pleasing was in the subtle, witty wordplay of its lively, colorful script. “I’m the only British guy that contributes to the narrative and I think I’ve been colored by the pun culture of the tabloid press in Britain. Most of the terrible puns you can find in the game are directly attributable to me” — look out for “Shangri Lager”, a nod to the recently announced Shangri-La single-player missions, for a taste of Mark’s punmanship. 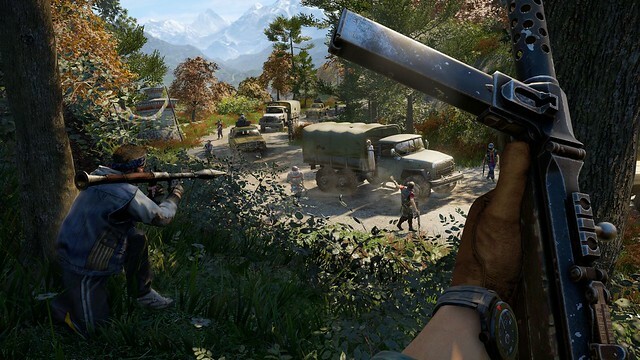 You can get your hands on Far Cry 4 on November 18th for PS4 and PS3. I loved Far Cry 3, but this is again similar to Assassin’s Creed in that I am still very hesitant to let myself be excited about the next game in the series (at launch at least, for full price…) until I see some reviews.. because I hope this is a progression from Far Cry 3, not just a pretty new version of it. The story is what needed the most fine-tuning in Far Cry 3. Other than that, it’s obviously TONS of fun playin in the open world of Far Cry.. so I’ll eventually get the game regardless. I just hope the story turns out to be good too, to glue it all together. Can Ubisoft please finally just stop with those extreme bullshots! It’s so awful. Not only that the graphics in every possible way are heavily touched up, but also all those scenes are so staged. This is in no way acceptable! The only thing I’m understanding from this article is that this game’s narrative is ‘a fish out of water’. Perhaps like some kind of dark Monty Python set in Nepal? They didn’t want to misrepresent the plight of child soldiers in the conflict, so there are’s a lot of shooting just for fun in the game? I’m not sure what that paragraph is even supposed to convey. Am I missing something? Nah, that’s really how the game looks. For real! Like Ubisoft said before, they just took the PC version running at max settings and put it right on the PS4, and it just worked OOB. Because the new consoles are so much like a PC. That’s why all versions will look the same. I’m sure there will be no mysterious settings this time around, right Ubisoft? You guys will scrub those right out. Far Cry 3 was outstanding and the fourth instalment here looks even better. Can’t wait for its release later this year! This game is gonna rock, THANK YOU FOR ADDING COOP!!!! I CAN’T SAY THAT ENOUGH!!!!! THANK YOU FOR ADDING COOP!! Farcry 4 is already a must-buy….Ubi did a great job…game looks really good.I’ll be buying it later.Still got Farcry 3 sealed. I’d love crossplay with my Wii U, Sony. Just saying. Not implying. Not implying Nintendo can have online relations here. With their new battle game. Awesome graphics you got their for the PS4. I was a huge fan of the last Far Cry game. It was AWESOME. I love the open world and all the detail that they put into it. If something’s worth doing it’s worth doing right. Looks like these guys and gals subscribe to the same school of thought.